I bought this book because, well, the cover art is nice, and I've been to Tokyo but missed out on visiting inner Tsukiji Fish Market. The artist and author of this book is Morinaga Yoh (モリナガ ヨウ ). This is where I wished I knew how to read Japanese because the book's written totally in Japanese. 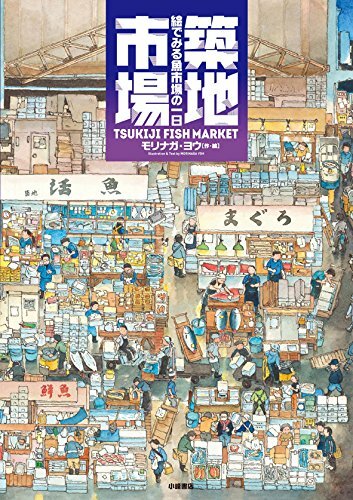 In this 32-page large hardcover artbook, we follow the Morinaga Yoh and his two friends, an octopus and a squid, to tour Tsukiji Fish Market. This is an infographic illustration book, something like the many DK books I've featured. There are plenty of illustrations and accompanying caption. The book starts with a huge truck driving into the fish market in the early morning. It has drawings and information of the type of ships used for fishing, the types of fish they catch and sell, how they treat and preserve the fish, the market layout, selling process, how to check for the freshness, who are the buyers, the equipment and vehicles used in the market, who are the workers, how the fish are sold, who they are sold to, and a timeline of activity that happens in the market. The art is drawn in the style of pen and ink with watercolour. The text is a mixture of handwritten and computer type. I love the sketchbook journal style art and text. It really creates that sense of immediacy, the feeling that the artist was drawing there on location. This is such a good way to document something. Yeah, you could probably document using photos and videos, but you won't have the charm that's associated with hand drawn art. It's a beautiful book. Not too expensive. Retail price is 1,620 yen (~US $15) from Amazon Japan. It's selling on various Amazon branches. But it might be cheaper to buy it from Amazon Japan and pay for global shipping. Compare prices first.